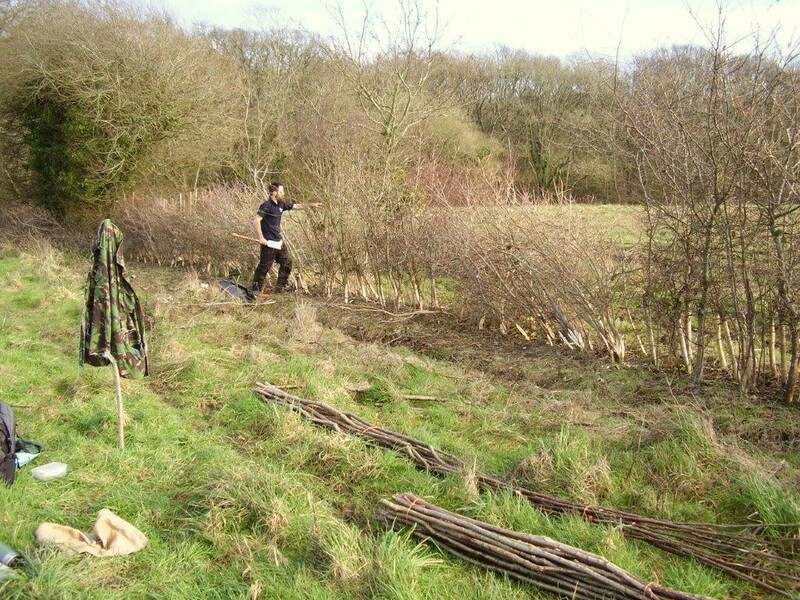 The communities of Walberton and Binsted have been active in planting hedges since 2004 - see the Hedge Planting History map on our Hedge Planting page. The National Park Authority Rangers Simon Mockford and Sam Buckland have inspired us to lay the hedges in our area to improve their traditional appearance and their value for wildlife and as livestock boundaries. 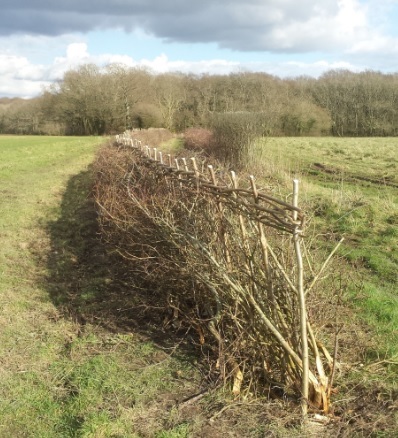 First, a 273m-long hedge planted by our predecessor organisation Walberton Action Group on Scotland Lane in 2004, was laid in 2015-16 by National Park Rangers and Volunteers and MAVES volunteers. In spring 2016, above left, the east end of the hedge is being laid down, with partially severed trunks. 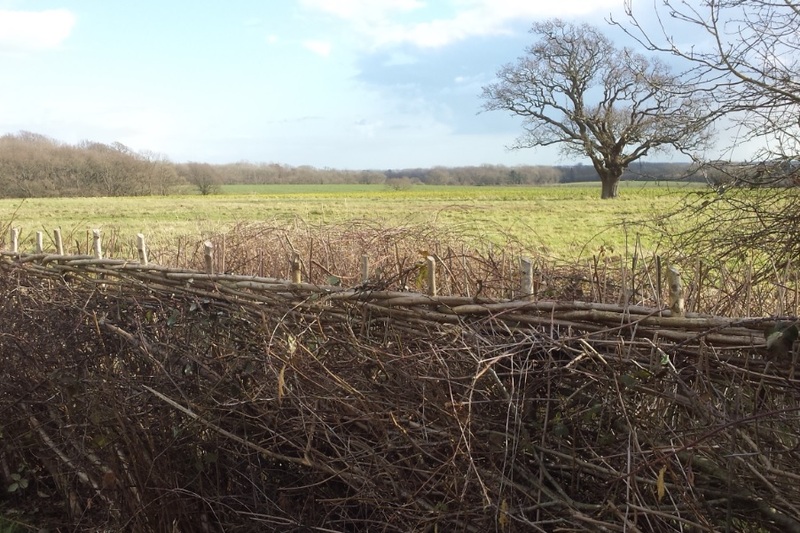 The hazel rods seen lying on the ground are then formed into stakes and ties to make a rigid, livestock-proof structure binding together the laid bushes, as seen below left. The path leads into Binsted Woods SNCI, a very special area of ancient woodland. In spring 2015, the west end of the hedge was laid. The photo below is taken from inside the Park. The field with the tree is outside the Park; the field beyond is inside. The mapped boundary is an irrelevance in beautiful Binsted, whose landscape is a unity of interlocking woods and hedgerows, undulating fields, and streams between. 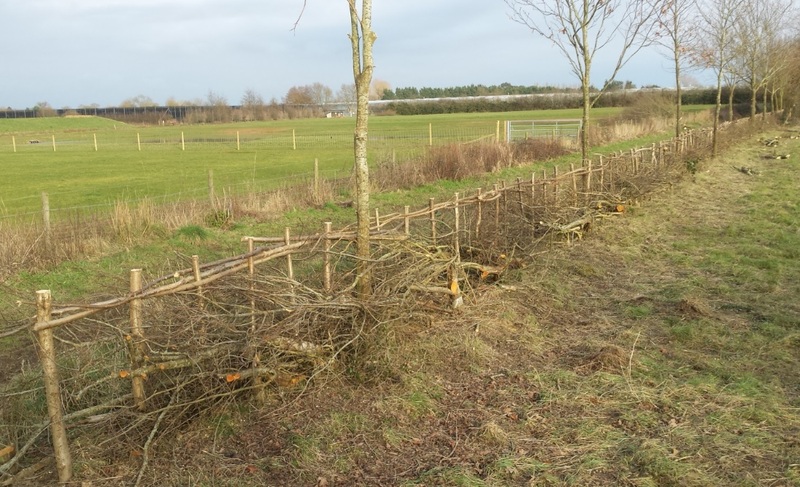 Inspired by the Ranger led work at Scotland Lane, Binsted Nursery engaged its contractors Andrew Cossar and Tom Warburton of Pro Forest, who had planted all the Walberton Action Group hedges in 2004-5, to lay the first hedge they had planted for Binsted Nursery. This was planted in 2001, so, 15 years old. Planted in a more sheltered and fertile site, these trees were much larger than the ones at Scotland Lane. To make the project viable, some delicate chainsaw work was required; the traditional billhook would have taken too long. This approach was successful. On the left you can see part of the hedge already laid (and with some brushwood removed), and part of it as yet uncut showing what we started with. 3. 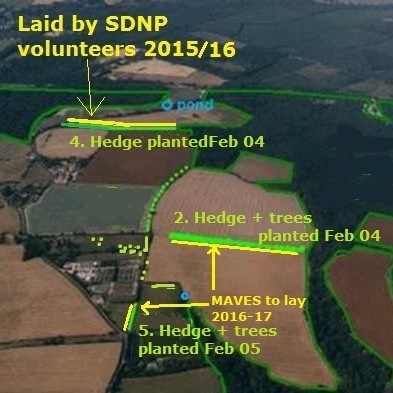 Two more follow-on Hedge Laying projects: Jan/Feb 2017? 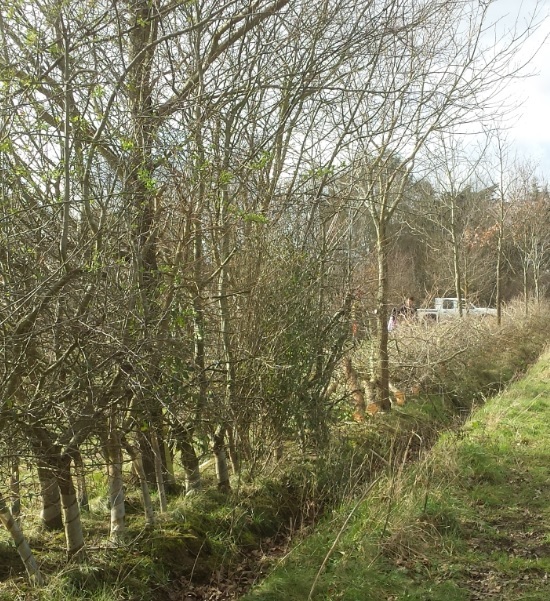 We would like to continue the work done on Scotland Lane by laying two more hedges that were planted in 2004-5 by Walberton Action Group with Pro Forest. We hope to continue to have National Park Ranger involvement and to engage more volunteers in the activity. MAVES also has an offer from Binsted Nursery to sponsor £1000 of Pro Forest time towards these projects. Both of these hedges like the first one run along public rights of way close to the Park boundary. The more southerly hedge, pictured above, runs through the sheep pastures where the annual Binsted Strawberry Fair is held. It is about 75m long, fenced all round against the sheep so one side fence would need to be temporarily laid down for access. It is planted on a wider spacing so the trees have grown tall, and contains holm oak as standards in addition to hawthorn, blackthorn, spindle, guelder rose, hazel, wild privet and buckthorn. 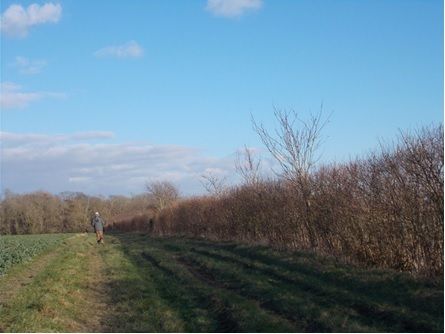 The hedge to Spinningwheel Copse, the more northerly of the two and pictured below (also just visible through a gap in the middle distance in the above photo), is a similar species mix to the Scotland Lane hedge, but stronger-growing and with the addition of oaks and wild cherries at intervals to be kept as standard trees. It is about 300m long; laying would reduce winter shading of the footpath and restore views enjoyed by walkers. The Strawberry Fair field shown above, is managed for conservation and fully meets the criteria for inclusion in the National Park (indeed the whole of Binsted did so according to the Countryside Agency). But the boundary is actually the stream at the back of the field.